Arrowhead plant (Syngonium podophyllum): growing, planting, caring. An easy to grow houseplant. Syngonium podophyllum is a species in the Araceae family, and commonly cultivated as a houseplant. Common names include Arrowhead plant, Goosefoot, African or American evergreen. It is the most commonly cultivated species in the genus Syngonium, and is often referred to simply as syngonium. 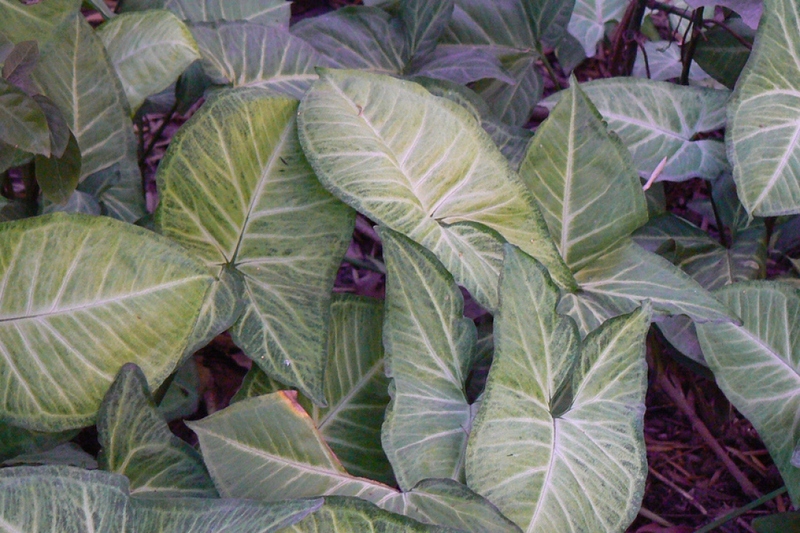 It was originally confused with the similar-looking African genus Nephthytis, and this is still used as a common name for the plant. There are several variegated cultivars, the main differences being in the position and extent of the cream or white markings. Some leaves are almost entirely white, pink or yellow. All parts of the plant are poisonous and cause severe mouth pain if eaten. It is not unusual to find these growing in Sub-tropical Florida landscapes, where homeowners and yard workers need to be aware of the severe skin burning sensations caused by the plants sap containing oxalic acid and the eye damage potential. When buying your syngonium, give it a suitable container for its size: not too big to avoid the persistence of too much moisture after watering, and wide enough to suit its spread - and with holes in the bottom for a good drainage! Little trick: put the pot on a tray of clay balls held wet to increase the humidity. Install your syngonium in a light, humic, rather acidic, draft-free spot, with a correct light exposure but without direct sunlight ... at the risk of foliage whitening. If necessary, sift the light from the window by a curtain. Namely: the green varieties more support better a slightly shaded situation than the variegated white or cream that will need more light to keep the intensity and contrast of their colors. Be careful, a too dark situation makes the syngonium wither, its stems will then lengthen, to look for more light. Keep it at a temperature of at least 15 ° C in winter, and around 20 ° C during growth. Your syngonium needs to be watered regularly, two to three times a week during the season, with room-temperature water and ideally non-calcareous. Rainwater is good, otherwise, remember to put water in a container a few hours before watering for chlorine to evaporate. The potting soil should be slightly moist during the entire growing season. You can supplement the waterings with daily foliage sprays, or even clean the leaves with a damp sponge from time to time. From the beginning of the fall, you will reduce the frequency of watering once a week, and spray only if the heat dries the air in the room. During the winter rest period, the substrate should slightly dry between two waterings.